Description: Amtrak's Three Rivers crossing the Rockville Bridge in the afternoon. Description: Amtraks Broadway Limited crosses the Rockville Bridge as it approaches Harrisburg. Description: 440 arrives at Springfield while the 448 idles at the station. Description: The south bound Cresent passes through Mogan on the west side of Temple Ga. 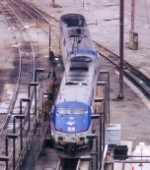 Description: P92 arrives at the Orlando Amtrak station. I was about to get on this train, this marked my first Amtrak Trip ever. I didn't go far, just about 30 miles up the line to Deland. Description: The power for the City of New Orleans slowly moves through the wye and onto the BNSF Thayer South Sub. Description: Train 58 slows to a stop at Central Station to wait for it's normal departure time of 10:40 pm. Description: Amtrak 371 passes through the Wyoming Yard. Note that AMTK 371 is doubleheaded and that is unusual. Title: Amtk 371 continues through Downtown Grandville. Title: Those P-42s can really fly! Description: #64 eastbound at Amsterdam. Description: Amtrak 188 now leads the Vermonter onto NECR rails in Palmer. Description: NS 9824 on CSX train Q491 meets Amtrak train 90 south of Lane, S.C. Description: This is the first time I got to see the Auto Train as it enters the Auto Facility at Lorton. Description: Amtrak #21 the southbound Texas Eagle has just departed Longview, TX. Description: Amtrak P098 overtakes a northbound CSX freight.